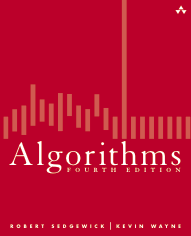 We will be using the Algorithms, 4th edition, textbook by Sedgewick and Wayne (SW). Literature in parenthesis is not in the curriculum (and should not contain essential new things), but we recommend that you review it since this is assumed knowledge for the rest of the course. 3/10 Balanced trees; hashing (slides, code) SW 3.3, 3.4, PR04 until sec. 2.1 handout, SW 3.2.6, 3.3.1, 3.3.4, 3.3.9, 3.3.16, 3.4.4, 3.4.10, 3.4.13. Hand-in 1, due September 19: War! (pdf, data). Hand-in 2, due October 10: Gorilla Sea Cucumber Hash (pdf, data). Hand-in 3, due October 31: Mining Laws of Nature (pdf, data). Hand-in 4, due November 14: Word ladders (pdf, data). Hand-in 5, due November 28: Super Vector Mario (pdf, data). Some exams include discrete mathematics, not directly addressed in this course. Multiple choice style: June 2011 (will be used for trial exam) (answers), January 2011 (answers), June 2010 (answers), Trial exam, May 2010. Oral exam style: Fall 2008 + spring 2009, Fall 2009, Spring 2011 (selected solutions).